Eating and actually enjoying salmon has been a food journey for me. I didn’t grow up eating salmon and until my early 20s was convinced I hated all fish. After learning about all the amazing health benefits of salmon, I decided to make it my goal to find ways to prepare and enjoy salmon. 5 years later I’m happy to say that I’ve arrived! I love a good piece of fish and am not afraid of making salmon at home. Salmon is an anti-inflammatory powerhouse full of healthy fats and nutrients. When buying salmon look for wild Alaskan salmon. You’ll get far more health benefits than farmed salmon. I buy it at Costco and it’s great. This honey lime marinade is my favorite for salmon. I sometimes make the salmon with that marinade and just serve it with roasted sweet potatoes. 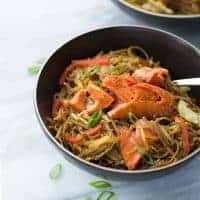 However, my kids love “stir-fry” noodles (and I love that it gets them to eat cabbage) and the flavors of this dish go so well together. Look for 100% buckwheat soba noodles to keep this dish gluten-free. Soba noodles are such a treat if you haven’t tried them! You’d never guess they’re gluten-free. During the 3rd trimester of pregnancy I tried to eat salmon twice a week. I still aim to eat it once a week and have come to love it. 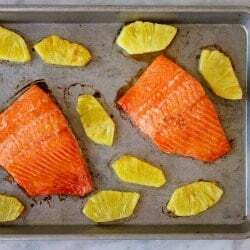 I also love this salmon recipe from food network and this Sweet and Spicy Pineapple Salmon from my blog years ago (still a good one). But for now, I can’t stop making this dish on repeat! 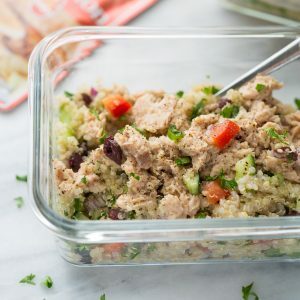 This is a light, flavorful and healthy meal that will leave you feeling good. The salmon marinade is delicious in many other dishes too! 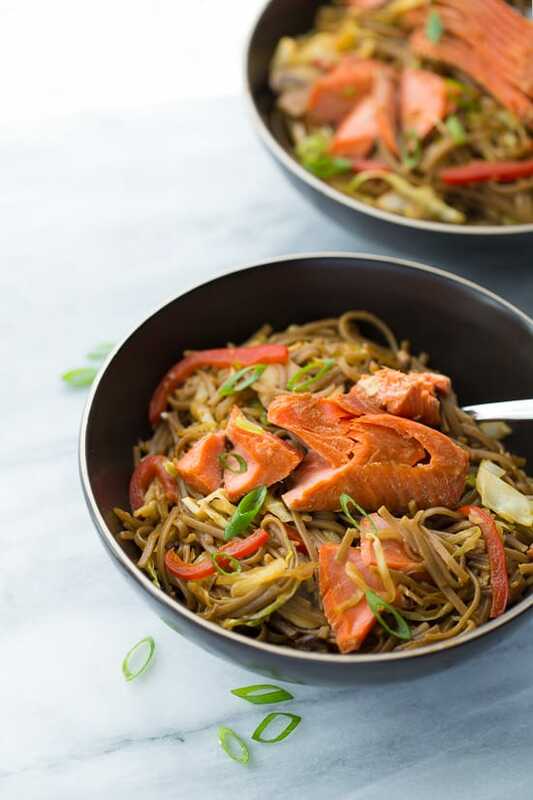 Be sure to use gluten-free soy sauce (tamari) and to buy 100% buckwheat soba noodles to keep this dish gluten-free. I like King Soba 100% Buckwheat Noodles. Whisk together all the ingredients for the salmon marinade. Place the salmon, skin-side up, in the marinade and let sit in the refrigerator for 30 minutes-4 hours. Preheat the oven to 400F. Pour off the marinade, flip the salmon then bake the salmon for 15 minutes (about 10 minutes per inch thick). Once cooked, remove the skin. Meanwhile, cook the soba noodles in boiling water for 2-4 minutes. (Don’t overcook – check them at 2 minutes.) Rinse with cool water to stop the cooking. You may need to rinse the noodles again to get them to loosen up if they sit for a bit while you make the stir-fry. Whisk together the ingredients for the stir-fry sauce, set aside. In a large skillet, heat the coconut oil over medium heat. Add the ginger, garlic, and scallions. Cook for 1 minute until fragrant, then add the mushrooms. Cook for 2-3 minutes then add the red pepper. Cook for another 3-4 minutes then add the noodles and cabbage. 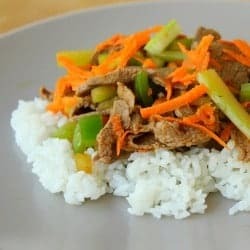 Add the stir-fry sauce and toss to combine, using tongs if needed. Cook until the noodles are hot and the cabbage is slightly wilted. Serve topped with the salmon. Enjoy! This looks like such a lovely meal. I love the simplicity of the sauces. This looks so light and refreshing yet still satisfying and hearty – hard combination to nail! I’m gonna give it a go on a day I’m really craving salmon. Such a flavorful recipe! Love that this is gluten free and dairy free dish. Such a delicious and healthy meal. Thank you! Salmon is so delicious this time of year! Hi there…loving your recipes. 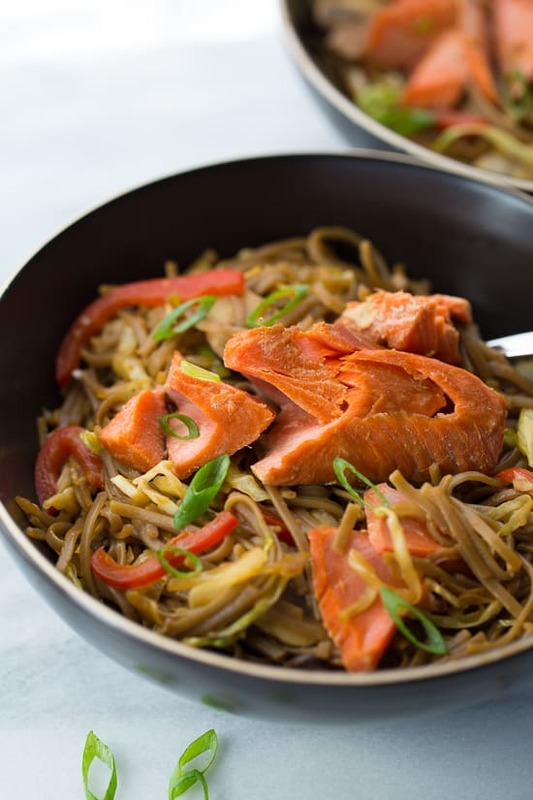 For the honey lime salmon & soba noodles…could you use the marinade for the stir fry sauce?? Curious.